Researchers at Hull University have been working with Neptune Renewable Energy to develop a tidal power converter. Researchers at Hull University’s Marine Renewable Research group have been working with Neptune Renewable Energy to develop a device that converts tidal power into energy. Following extensive research, the Proteus NP500 Tidal Power Pontoon, has, it’s claimed, achieved an efficiency that is greater than any other tidal power device. Manufacturing costs of the device are said to be minimal, which means that, tidal electricity can be generated at commercially competitive prices. Once manufactured, ten Proteus devices could potentially provide 15 per cent of Hull City Council’s energy requirements. The device generates power by using computer-controlled shutters that direct tidal currents onto a large multi-paddled water turbine. Devices have been tested in the university’s research facility at The Deep, Hull’s futuristic submarium, and the next step is to create a full-size prototype that would be positioned in the Humber. The Proteus device has now been patented by the Neptune Group, who are raising funds for the first full-scale demonstrator version. 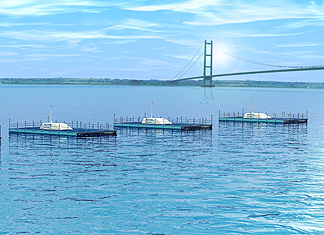 This will be project-managed by the University’s Environmental Technology Centre for Industrial Collaboration (ETCIC), and is due to be tested in the Humber in 2008.